The comfortable rolling swivel stool features a thick cushioned seat with a mechanism (seat plate) screwed which can rotate 360-degree freely, equipped with a sturdy hydraulic gas lift cylinder to adjust height(height range 8"), a heavy duty 5-legged metal chrome base with durable dual-wheel casters which can roll smoothly and swivel 360-degree .The hard-working stool chair makes it easier to get through a busy day, very convenient for multi-tasking work. The contemporary style is applicable to home and workplaces. *Stool is also available in black. Caution:Remove the plastic cap on the top of the gas lift before assembly! This is a part of packaging only! Comfortable & durable - Stool chair with 13.5" diameter x 3" thick cushioned seat,brand new high-density sponge,high quality off-white bonded leather upholstery. Convenient for multi-tasking work - a hard-working hydraulic stool,360-degree swivel, adjustable height from 22 to 30 inches. Easy movement - rolling stool with large 3" diameter size soft polyurethane caster wheels,runs safely on all soft and hard floors,including hardwood, laminate, tiles, slate, carpet and wood without scratches. 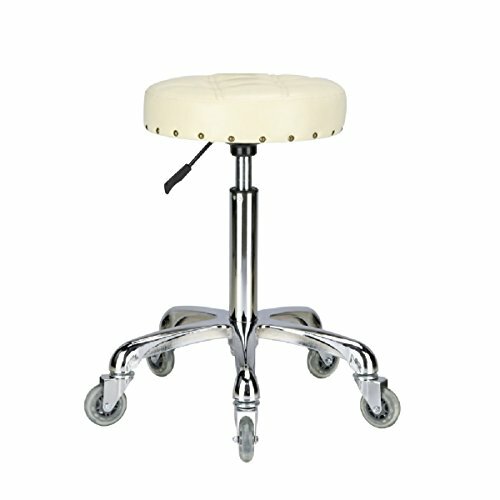 Weight capacity 400 pounds - The heavy duty stool is well constructed, very sturdy and durable. Simplified assembly - Only 3 steps to have work done.Very easy to assemble. If you have any questions about this product by KARRIE, contact us by completing and submitting the form below. If you are looking for a specif part number, please include it with your message.